How fast should you respond? It depends. A tool is not a way of life, but sometimes even I forget that. Not too long ago, Jake Kuramoto wrote a post asking if touch typing is an obsolete skill. Kuramoto is a touch-typist, and he wonders about those who are not. It would seem odd that touch-typing classes have not become a prerequisite of computer science courses, if only to help the students become more productive. I don’t know if they are, but somehow I doubt it. In a comment, I provided my own experience with touch-typing, and the tangible benefits that it provided to me. Basically, I'm lucky that I took that typing class instead of a more academic class. At the time, I had no idea that the keyboard (a word I never used at the time) would become one of the primary communication devices for the next 35+ years. Back then, my highest ambition was to use an IBM Selectric because it simplified the correction process (no erasers!). On a more practical level, I had no idea that almost every job that I would have in the future would involve using some sort of keyboard (either a typewriter or a computer keyboard). Even when I'm thinking while typing, touch typing benefits me because I can look at the screen rather than worrying about where my fingers fall. And occasionally, when the words just flow, I can hit my stride and type away at my claimed speed of 60 wpm, or perhaps much faster than that (I've never bothered to test myself recently). So in essence, we have the tool called the typewriter, whose benefits were directly transferable to the tool called the computer keyboard. However, a subsequent comment from Jake reminded me that keyboards (whether computer-based or typewriter-based) may not survive for much longer. Voice can keep up, and it's improving. Typing at all will be obsolete in the next ten years. When voice input achieves maturity, what will I do with my fingers? Play the piano? Oh, I forgot - I already use MIDI programming for that. But not by voice - yet. Biometrics without a body - redefining biometrics? One of my mailing lists is in serious chatter mode regarding a white paper recently released by Eurosmart, an organization that describes itself as "an international non-profit association located in Brussels representing the Voice of the Smart Security Industry for multi-sector applications." Examples of such applications include smart cards and smart USB tokens. Our vision has been always that personal data and especially biometric references should be stored in a smart card. The development of Biometrics is a result of political, economic and technological globalisation. The world is now a global place for trade, migrations, transfers and reliable exchanges of all kind of information and values, physically and / or remotely. This can give rise to new risks, problems, fraud, illegal traffic, identity theft or even terrorism. Biometrics is seen as the best solution for identification or authentication as it is directly linked to the person (whoever he /she is). Identity theft has been classified as the fastest growing white collar crime since the mid-1990s. For goods and documents that also need to be guaranteed as genuine or identified / authenticated, some technologies may be used that can be classified as biometrics for objects. For goods and documents that also need to be guaranteed as genuine or identified / authenticated, some technologies may be used that can be classified as biometrics for objects. These biometric methods use a biological characteristic of the individual or object. For example, fingerprints, iris texture, shape of the face or hands, wood grain or even atomic minerals in the organization. Now I have been to nearly ten years of International Association for Identification conferences, and if any IAI practitioner was ever discussing wood grain, they never referred to it as "biometrics." As you will see below, some people consider even this an extension of the traditional definition of biometrics. These are the biometric methods that reproduce a natural phenomenon for elements whose characteristics are chaotic and measurable, for example, surface states, the bubbles in the material, manufacturing defects. For instance, digital watermarking, surface aspects and bubble tags are object biometrics. When you think about it, it's obvious why a smart card association would want to argue that elements on objects are "biometrics" that can be identified. A popular current definition of biometrics is: "the automated recognition of individuals based on their physical or behavioural characteristics". So when Eurosmart, a leading association dealing with smart cards and smart devices, released its lengthy and quite informative white paper into biometrics, it was with some surprise when its definition of the technology now includes inanimate objects. Planet Biometrics awaits industry reaction with interest! Although this particular word is atypical of the conversation, it's fair to say that the commenters do not necessarily agree with Eurosmart's definition of biometrics. Biometric definition is best explained by understanding its nomenclature. The word "biometrics" is derived from the Greek words 'bios' and 'metric' ; which means life and measurement respectively. This directly translates into "life measurement". General science has included biometrics as a field of statistical development since the early twentieth century. A very good example is the statistical analysis of data from agricultural field experiments comparing the yields of different varieties of wheat. In this way, science is taking a life measurement of the agriculture to ultimately determine more efficient methods of growth. Biometrics technologies measure a particular set of a person's vital statistics in order to determine identity. In the most contemporary computer science applications, the term "life measurement" adapts a slightly different role. Biometrics in the high technology sector refers to a particular class of identification technologies. These technologies use an individual's unique biological traits to determine one's identity. The traits that are considered include fingerprints, retina and iris patterns,facial characteristics and many more. These two categories correspond to the first two (of the three) categories in the Eurosmart white paper (physical = morphological/physiological), and these are the two categories that most of the biometric practitioners that I have met actually talk about. For example, for the last sixteen years I have been involved with automated fingerprint identification systems, or AFIS; fingerprints are an example of physical biometrics. Depending upon your point of view, Eurosmart is either using an inclusive definition of biometrics that offers great benefits to the world, or it is appropriating an already well-defined term for a completely different use to enhance its legitimacy. However, Eurosmart may want to rethink its strategy. Because if it really wants to claim that objects are biometric technologies, then Eurosmart will have Simon Cole (previously mentioned in the Empoprise-BI business blog here) and the National Academy of Sciences (previously mentioned in the Empoprise-BI business blog here) breathing down its neck, demanding scientific proof of its claims. I've been meditating on customer support, after having spent the last two days monitoring a customer support issue that involved two major media companies. For the purposes of this post, the identities of the two companies are not important, although if you're curious you can check out this post in my Empoprises Amplify blog or this Facebook page (click on "Just Others" to see the relevant discussions). As customers, we expect that vendors (a) immediately identify the cause of a bug, (b) immediately let every one of their hundreds or thousands of employees know about the bug and its resolution, (c) immediately let every one of their customers know about the bug, in any media we choose (company website, Facebook, Twitter, our e-mail box, newspaper advertisements, postings in laundry room bulletin boards, etc. ), (d) provide everyone involved with the exact time that the fix will be implemented, and (e) fix the problem in two minutes or less. We get frustrated when one support person says one thing and another support person says another thing. Why is one support person telling me to reboot, reinstall, or move to the United States when another support person is telling me that there is a known bug and we don't have to do anything? We get frustrated when the company doesn't communicate to us. Why is one company employee posting cryptic messages on the company website, another company employee posting less cryptic messages on the Facebook page, and neither company employee providing hourly updates? And why can't any of the company employees say something other than "we're working on it"? Why can't they tell me that the problem will be fixed by tomorrow at 3:00 pm? And why do I have to wait until tomorrow, anyway? You know what the problem is, or should know what the problem is - can't you just get one of these code whiz kids and fix it in five minutes? At the same time, the vendor has issues of its own. Vendors expect that customers (a) immediately provide bug reports of true verified bugs to the company's preferred support mechanism, having previously created any required logins and passwords, (b) allow the company time to verify that the bug is truly a bug and not a result of the customer using that really cool special software that was downloaded from that really cool warez site, (c) allow the company to let its employees fix the bug, rather than requiring the employees to waste valuable time replying to every danged Facebook message and tweet that complains that the company is a bunch of "loosers," (d) allow the company to fix the bug and get it done right, realizing that modern systems involve a number of interconnected components, any one or three or ten of which may be the cause of the problem, and (e) realize that no company is perfect, and that just because you can't use the device for an evening doesn't mean that the world should end, or that our company's Board of Directors should commit mass suicide. So how do we bridge the gap between customer and vendor expectations? And if we can't bridge that gap, then how do we narrow it somewhat? I got a phone call at work one morning, and it was obviously from the first moments of the call that the caller had no idea who I was or what I did. The caller asked to speak to the person in charge of sales and marketing. I asked what this was about, and didn't get a clear response. I then named my employer and asked if the person had the right number. That's when the person said that he wanted to speak to someone in Motorola. When I asked Quora which tech startups should I interview that I hadn’t interviewed yet, AllMyApps was at the top of the list. I told the team that I look for things on the list of tech battlefronts (like Android vs. iPhone vs everyone else, or which slates can beat iPad, or which mobile apps are doing best, etc). So, a new mobile app wins out over one that runs on Windows, I told them. Why? Microsoft Windows just isn’t on a tech battlefront anymore, according to my biases. Now you can argue that Scoble is wrong, that the new Windows multi-platform strategy is the wave of the future. And perhaps Scoble is wrong. But that doesn't matter one whit if you want to pitch to Scoble. Twitter and other online social tools have made it possible for me to have a kind of light, continuous contact with so many people, and this contact has become an essential part of my life. If those people are meatspace friends, it intensifies the relationship and saves us both time. Instead of asking them, “what have you been up to?” when we see each other I can say, “I don’t really like it either,” and without explanation we both know what we’re talking about. Meatspace friends who aren’t online are a conspicuous absence. Now people may claim that Balara is wrong (see the FriendFeed thread), but the fact of the matter is that if Balara prefers to connect to people via Twitter (and that was in 2008-2009; I have no idea how he connects to people today), then if you want to connect to Balara, you do it that way. So, this is an additional argument for MicroPR: forcing PR firms to approach us in the open, on open social flow apps like Twitter, and in the small, where they have to jettison all the claptrap of the old press release model. In the open, that can’t lie easily, or they will be caught on it. In the small, they have to junk the meaningless superlatives, the bogus quotes that no CEO ever mouthed, the run-on phrases, the disembodied third party mumbo jumbo, as if the press release were edited by God. On Twitter, I will simply block people that abuse my willingness to have an open dialog about products with PR folks, or basically anyone else, for that matter. And I am implicitly inviting everyone in my Twitter sphere of influence to participate, too. I want it to be a shared space for investigation into new tools, so by all means, twitpitch me! So now you know why I never tried to pitch Scoble on the product that I managed a couple of years ago. Not that it's not innovative - and for the record, it became more innovative after someone else started managing it - but it's not innovative in the areas in which Scoble is interested. When a product is sold mostly to government agencies, and when the product uses Windows workstations and Windows mobile devices, it was pretty clear that it wasn't going to be discussed by Scoble and Shel Israel. That having been said, if you ARE interested in fingerprint, palmprint, and other biometric technologies for criminal and civil applications, I can put you in touch with my successor. Just don't refer to him as a Motorola employee. If you're employed, you might take a moment - but not necessarily on company time - to think about your company's reporting structure. Do you work for your boss? Do you work for the company CEO (assuming it's someone different from your boss)? Do you work for the stockholders (assuming your company is public)? Or do you work for someone outside of the company? At most companies, since almost every department is trying to maximize the company’s self-interest - no one is championing customers’ best interests. Product Management and Product Marketing teams should fill this void by always thinking about, championing and fighting for the customers’ best interests. This is not an easy battle to fight (you may even get fired for it!) - but this is one of the biggest values a PM team can add to their company. More here. And be sure to read the comments, which explore the nuances of the concept. But are product managers the best candidates for this job? I would advance the salesperson as a good candidate to do this, since he/she is not only closest to the customer, but is the one who stands to gain the most from satisfying the customer - at least in markets where you have repeat customers. For similar reasons, I'd also nominate the program manager - the one responsible for the success of an implementation at a customer site - as another candidate. No, I normally don't post to my Empoprise-BI business blog on Sundays. But today, December 26, I have found myself thinking about Facebook a lot. Therefore, I figured that this was an opportune time to revisit the decision that I made nearly two years ago to join Facebook, and to see what I had learned since I made that decision. I used one of my Ontario Emperor blog posts to write about my decision to join Facebook. That post was written on February 26, 2009. Shortly after that, I pretty much quit blogging under the Ontario Emperor pseudonym - not just because of my decision to join Facebook, but that decision, coupled with some other decisions that I made, indicated that the pseudonym had pretty much become pointless. The pseudonym is primarily only used for certain musical applications. That was probably the first thing that I realized about Facebook; people from all walks of life are on it. This is something that I certainly wasn't finding on FriendFeed, since most people hadn't heard of FriendFeed (this was back when FriendFeed was still an independent entity), and even the larger services such as MySpace and Twitter, which certainly containing slices of my friends, didn't have a wide variety of my friends on it. I reluctantly "re-joined" after a 14 month hiatus. It has been great. You can ignore the games and apps and make it as serious or goofy as you want. I have gotten in touch with friends and relatives I haven't seen in over 20 years. I segregate Facebook for "real life" friends only. Twitter/Friendfeed is for everyone else. At the time I didn't know what Jared was talking about regarding games, apps, or segregating. I subsequently learned. By July, this blog included a post regarding an outage of the Farm Town application. By November, I was writing about Starfleet Commander - and you could read the same post as a note on the Empoprise-BI fan page. Yes, I have fan pages for some of my Empoprises blogs on Facebook. But why would I need those, since I already had similar functionality on FriendFeed? Well, as I've already implied a couple of times in this post, FriendFeed ceased to be an independent entity in August 2009. While the service wasn't immediately shut down and survives (mostly) to this day, I knew that I had to make alternative plans in case FriendFeed were to start pining for the fjords one day. However, I certainly continued to use FriendFeed, and in fact pumped all of my FriendFeed activity into Facebook. This resulted in some confusion from some of my Facebook friends, and subsequently resulted in a decision on my part to silo my FriendFeed activity from my Facebook activity. Now that I've gotten neck-deep into this post, it's interesting to note that I'm talking about FriendFeed about as much as I'm talking about Facebook itself. Obviously, this is not the case for 99.9% of Facebook's users. [M]y initial thought is that I will use it in conjunction with my LinkedIn and Plaxo accounts (and, to a limited extent, with my MySpace account). I won't be following over a thousand people like I do in Twitter or FriendFeed, but the Facebook account may not just consist of people that I've physically met either. In a sense, I was right. A number of my co-workers are on Facebook, and I like to share a number of industry-related items with them. (If you're a friend on Facebook and haven't seen these items, it's because I only share them with people on the "MorphoTrak" Facebook list, since most of the rest of my Facebook friends don't care about NAS and NIST and WSQ.) As for strict integration with LinkedIn and Plaxo, not really - especially since I rarely use Plaxo these days (although I haven't deleted my account). As for friends - as of today, I have 338 friends on Facebook, and I'd guess that I've never met half of them in real life. For me, that's a pretty good ratio, since I've probably met less than 5% of my Twitter friends in real life. Oh, and regarding the discussion of poking at the end of my Feburary 2009 post - I've probably been poked a few times over the last 1 1/2+ years, but have not poked anyone on Facebook myself. Josh's birthday was coming up soon, and everyone was busy preparing for it. Terence was out shopping, trying to find something to buy for Barbara. Barbara, meanwhile, was reading an article from Todd in the business section of the paper, talking about the latest economic forecast. Todd, having finished his article, was listening to Phil complain about having to work on a holiday. "The bum should be thankful he has a job," Todd though. Phil, meanwhile, was completely absorbed in his job, as were Todd, Barbara, and Terence, and just about everyone else. I've referred to D.P. Lyle, M.D. 's "The Writer's Forensics Blog" before, and since it was a recent reference, I was able to find the past reference easily (sometimes it's not so easy). You'll recall that Dr. Lyle answers questions from fiction writers who want to make their stories more believable. My hero knows the villain, a werewolf, is extremely allergic to silver. He has to introduce a sufficient amount into the villain’s system to put him out of action permanently. He doesn’t have to die but no longer be a threat. A vegetative state would be okay. They are at a party to raise money to rebuild a church. The villain is a member of the church council so will be greeting the guests. The hero and villain have never met before. Note to self: when I attend a future council meeting at my church, watch out for the extremely hairy people. The author presented the scenario, which in the author's case involved silver. Now Dr. Lyle (presumably) has no direct experience with werewolves, so the doctor's response is based upon the human body. And frankly, I learned more about allergies in this werewolf conversation than I've ever learned before in my life. A severe allergy to virtually anything can kill the allergic person. From peanuts to penicillin and everything in between. And yes, sliver, too. Particularly in the world of werewolves and other fantasy situations. If the victim is severely allergic, skin contact of a metal such as silver might very well produce a sudden and deadly allergic reaction. This would be called an anaphylactic reaction or anaphylaxis. Our immune system is critical to our survival. We are constantly bombarded by potential antigens all the time, usually in the form or bacteria and viruses. The body recognizes the antigen (virus, etc.) as foreign and builds antibodies that will recognize and attach to the virus. This reaction attracts white blood cells (WBCS), which release chemicals that kill or harm the virus, which is then consumed by the WBCs and destroyed. This process is essential for each of us to survive in our bacteria and virus-filled world. But, in allergic individuals, this reaction can be rapid and massive and can cause the release of large amounts of the chemicals from the WBCs. This is the reaction we call anaphylaxis. Lesson learned? Don't be afraid to ask the esoteric question. There's a good chance that even if the situation in (the) question doesn't seem to directly apply to you, the answer might still be applicable to your own life. And what's more, this post gave me an excuse to post this. Here in southern California, we have just had to deal with a week's worth of rain. My friends in Europe have had to deal with devastating cold and snow. But none of us have had to worry about elephants charging around. THIRUVANANTHAPURAM: The Kerala government has agreed to consider a proposal to empower forest officials to carry out mock firing to scare away wild elephants. State food minister C Divakaran informed the Assembly on Thursday about the efforts being taken by the government to control the pachyderm menace in the forest regions of the state. And it's not just a matter of an elephant showing up on your street one day. Wild elephants have killed fifteen persons in Nilambur and Malabar forest regions of the state in the last four years. The pachyderm menace forced the state government to put solar fencing and trenches around the forest regions to check the increasing incidents of man-animal conflict. The Elephants are an integral part of the daily life in Kerala, India. These Indian elephants are loved, revered, groomed and given a prestigious place in the state's culture. Elephants in Kerala are often referred to as the 'sons of the sahya.' As the state animal, the elephant is featured on the emblem of the Government of Kerala. The concept is - quite literally - foreign to me, but I can imagine that it would be very disconcerting to me if the national symbol of my state actually killed a family member. Elephants are allowed to walk only 20 km per day during morning and evening hours. Beyond 20 Km trucks were made compulsory as per captive elephant management rule prevalent in the state. Protocol for control of elephants and role of mahouts were well defined and implemented. Based on the SWOT analysis following remedial measures was identified in breeding, feeding, management, season, age, musth incidence, musth forecasting, Mahout training, behavior, over work, cruelty, transportation and disease control in tune with 'Captive Elephant Management Rule 2003'. Musth forecasting system was formulated based on previous incidences of musth. For more on musth, see the non-embeddable Animal Planet video above. I was sitting at my desk at work when an outside call came in on my direct line. When I answered, the woman at the other end of the line asked for one of my co-workers - a co-worker who works in a different facility. When I said that I wasn't that person, the cold caller realized her mistake and then mentioned my name. When she confirmed that she was speaking to her second choice, she began to tell me about an Iraq conference, and mentioned that she had already sent information to me. I told her that I usually don't attend the types of conferences that she described, and terminated the call. Two hours later, I received the previously promised email regarding the Iraq conference, with 4 megabytes of attachments. Actually, the email was sent twice, which meant that I got eight megabytes of attachments. Since the fall of 2003, New-Fields Exhibitions, a Dubai-based marketing company with a corporate office in Washington, has organized over a dozen conferences promoting opportunities in Iraq’s reconstruction, security and oil sectors. So how did the three of us get on New-Fields' cold calling list? All three of us have been involved in some way with sales to the Federal government. I guess that New-Fields figures that anyone who has ever been involved in government sales would want to come to their conference. Companies large and small willingly paid the steep delegate fees: $2,000 to $3,000 for a two-day conference, with sponsorships running from $7,000 to a $12,000 “platinum” option. “We never imagined when we were planning our Forum that it would become so central to the current reconstruction of Iraq,” boasted New-Fields CEO Samir Farajallah. But is it so central? Well, it worked for speed dating, didn't it? The firm’s corporate dwelling, a shared, two-level space on the sixth floor of a glossy building five blocks east of the White House, is temporary and seemingly empty. Guests are greeted by a stern employee of the office leasing company perched behind a wide, cumbersome desk that blocks access to the bright, distinctly-modern, workrooms beyond it. Three unannounced visits from a National Security News Service reporter yielded three identical responses: no one from New-Fields was in. The leasing company employee, who would only identify herself as Dion, said that most New-Fields staff is located overseas—the Philippines, she thought. But when reached on the firm’s D.C.-area customer service line, project manager Carla Torres claimed that New-Fields has a Washington-based staff of approximately 100. Ms. Torres is among the handful of fast-talking women who answer New-Fields’ phones with thick Spanish accents and spell their names (Charlie, Alpha, Romeo…) using brisk military jargon. Both she and her colleague Erica Montero refused to reveal if and when New-Fields employees would be in the office, and turned down all meeting requests. Despite their assurances that “the appropriate person” would respond to numerous inquiries from the News Service, no calls were ever returned. An investigation into public records with the District of Columbia Secretary of State found that New-Fields’ corporate license has been revoked on multiple occasions, most recently last September, for failing to update its filings. The firm, in other words, is not legally authorized to operate in Washington—or anywhere in the United States. According to the D.C. Attorney General’s office, operating illegally is fairly common among liquor stores or corner groceries. But for an international marketing company that claims to host “the world’s largest and most respected” deal making forums that have “become so central to the current reconstruction of Iraq”? Read the rest of Lichtenheld's article here. Current estimates show this company has an annual revenue of $34,000 and employs a staff of approximately 1. But they (he) still got C-SPAN coverage, which I guess counts for something. The lesson here? Actually, there are a couple of lessons. First, note that I never would have researched this company if it hadn't been for its poor sales efforts. If the company had been halfway professional, I would have just declined its invitation and left it at that. But referring to me by the wrong name, displaying a haphazard cold calling strategy, and displaying a flawed e-mail strategy was enough to get me to wonder, "Who ARE these people?" Second, note that despite all of this, and despite the possibility that this leading firm merely consists of a boss and some telemarketers, the company is still able to put on conferences that get national press coverage. My boss refuses to move me away from a toxic co-worker. Now that sounds pretty bad. What is the toxic nature of the co-worker? I am a very giving person, and she takes advantage of my good nature. I have brought her Christmas and birthday gifts, but she has never once reciprocated. This was in an advice column. Guess who ended up getting the advice? See here (it's the second letter). A YouTube parody video from 2008. I do not like the idea that the United States Government may be forced into a trial in the media. I do not know who has given these documents to the media, but the purpose can only be one thing - trying to make me look bad." Jesse Stay shared a Business Insider post that referenced a statement in The Australian attributed to Julian Assange's lawyer. "I do not like the idea that Julian may be forced into a trial in the media. And I feel especially concerned that he will be presented with the evidence in his own language for the first time when reading the newspaper. I do not know who has given these documents to the media, but the purpose can only be one thing - trying to make Julian look bad." The Guardian's excerpts appear here. I can only think of three words. And the first two are "pot" and "kettle." Part of our organizational streamlining involves cutting our investment in underperforming or off-strategy products to put better focus on our core strengths and fund new innovation in the next year and beyond. We continuously evaluate and prioritize our portfolio of products and services, and do plan to shut down some products in the coming months such as Yahoo! Buzz, our Traffic APIs, and others. We will communicate specific plans when appropriate. When a whole host of blogs are commenting on the possible closure of a popular service like Delicious, do you really want your official response to be something like “we will close services when we see it is appropriate and on our own schedule, so leave us alone”? Why not respond to bloggers as if we care about the product and would prefer to find a way to keep it running? Why not tell us, “Due to various cost cutting measures, we need to close several services that do not generate enough revenue. Disappointingly, Delicious is among those services to be closed at an undetermined time.” If that was the response, bloggers would just be lamenting the death of a service, not talking about the continued failure of Yahoo to understand their own direction, or even the fact that Yahoo seems to have lost touch with the internet in general. In the comments to the post, I dwelt upon my experience with bureaucracy to state that Yahoo's response was understandable, given the circumstances. Because of the leak, Yahoo was required to provide a statement RIGHT THEN HURRY UP WHY HAVEN’T YOU SAID ANYTHING YET GET A MOVE ON!!! And Yahoo, like any large organization, can’t get a fully coherent statement out all that quickly. There are too many sub-organizations that need to be consulted, too many factors to consider (the employees who work for Delicious/AltaVista/et al, the advertisers, the investment community, etc.). In such a case, and when you have to get a statement out RIGHT THEN HURRY UP, the safest course of action is to say nothing. Incidentally, you can see the same thing when looking at the Wikileaks information. The government papers that Wikileaks has released, and the banking papers that Wikileaks reportedly plans for release, are essentially the rough drafts of the policies of the various organizations. The Wikileaks papers, like the leaked Yahoo slide, are not yet ready for prime time, and have to be digested and considered more thoroughly before being released to the public. While the Wikileaks papers and the Yahoo slide are invaluable guides to what people may be thinking, they are not necessarily good indicators of what people actually planned to do. In retrospect, I'm wondering if we're both right. Perhaps Yahoo! shouldn't have processes comparable to the U.S. Department of State, but at the same time Yahoo! might not necessarily be able to respond as quickly as your garden variety startup. Is it reasonable to expect that a company with 14,100 employees - OK, less than that - can mount an immediate response in an emergency situation? Search, as usual, isn't working - something that I noted in a comment on a HorsePigCow post from Tara Hunt. A few hours later, I'm back on FriendFeed and see people complaining that the "like" feature isn't working. After confirming this, I decide to post a message to FriendFeed and also send it to Twitter. I don't get very far. A few minutes later I tried FriendFeed again, and things seemed to work. But something was missing. In retrospect, it's natural that I shouldn't see likes on my own page. It's not like this is Facebook or anything, where you can like your own stuff. A workaround is to use a third party application such as fftogo to like things. But I saw one item that said that someone was occasionally getting kicked out of fftogo. On Thursday, I posted a video in my Empoprise-MU music blog. It was a performance of the "Trololo" song by the Gifford Children's Choir in Racine, Wisconsin, augmented by several other performers, including Principal Jeff Eben. eff Eben is an award-winning educator, leader, author and speaker. Paralyzed at the age of sixteen in a water-skiing accident, he built his life and career from a wheelchair. Jeff Eben’s twenty-five years in education include coaching football and basketball, teaching, and ten years as a principal, culminating in the creation of a National Blue Ribbon high school in the acclaimed Clovis Unified School District. His story of hope and leadership philosophy of “Feel the Love” has moved audiences and inspired organizations all over the world, including Oxford University in England. In 1998, Jeff was named Fresno County’s Administrator of the Year, and in 2006 was inducted into the Clovis Hall of Fame for Lifetime Achievement in Education. In 2007, he was honored with Fresno State University’s noted Alumni Award for the Kremen School of Education. Jeff was appointed Deputy Mayor of Fresno in 2007 and currently serves as the CEO of Fresno’s Convention and Visitors Bureau. He is the proud father of two grown children and resides in the Fresno area. The CVB will continue to pound the likes of Jay Leno and Conan O’Brien until they let us come on and engage in a debate where we can tell folks about the good things we offer. But I'm not sure how the people of Fresno felt when their staunchest defender left and went to Wisconsin. I'd bet that the dairy interests were particularly outraged, since Wisconsin is now claiming happy cows. And Eben is clearly integrating himself into the community, based upon his participation in the Gifford concert. I subscribe to several biometric feeds and mailing lists, and one of them mentioned some biometric research that is being conducted by the government of China. The cable in question discussed work by the Chinese Academy of Science (CAS) Institute of Intelligent Machines (IIM) in Hefei. Specifically, the IIM was working on gait recognition. According to the cable, the gait of an individual is measured by weight, as well as "two-dimensional sheer forces." This paper describes the development of a prototype floor sensor as a gait recognition system. This could eventually find deployment as a standalone system (eg. a burglar alarm system) or as part of a multimodal biometric system. The new sensor consists of 1536 individual sensors arranged in a 3m by 0.5m rectangular strip with an individual sensor area of 3 cm2. The sensor floor operates at a sample rate of 22 Hz. The sensor itself uses a simple design inspired by computer keyboards and is made from low cost, off the shelf materials. Application of the sensor floor to a small database of 15 individuals was performed. Three features were extracted : stride length, stride cadence, and time on toe to time on heel ratio. Two of these measures have been used in video based gait recognition while the third is new to this analysis. These features proved sufficient to achieve an 80% recognition rate. For more information on gait recognition, see this page from Global Security Intelligence. It turns out that IIM (mascot: The Fighting Bots) is not the only research institute that is investigating this. The technology is moving ahead at a rapid pace, however, with government-sponsored projects supporting research such as that going on at the Georgia Institute of Technology, MIT, the Lappeenranta University of Technology, and others [sic] academic institutions. The Laboratory, lead by Professor Ville Kyrki, educates experts of intelligent computing and produces new machine vision and pattern recognition solutions. The goal is to build usefull applications for industry and citizens. For example, research is focused on face recognition for a biometric passport and machine vision systems for automatic paper and board printability tests. In medical image processing retina images are studied for the efficient healthcare of diabetes. The two subjects are on figure skates. Everything in this section is a spoof. Mister Ed was no more a zebra than the origin of the nursery rhyme Sing a Song of Sixpence had anything to do with pirates on a recruiting drive. As for Mississippi's doing away with teaching fractions and decimals in its school systems because kids find them too hard to master, that's no more true than Kentucky's imposing a licensing fee on uses of its name, Edgar Rice Burroughs naming his celebrated apeman after the city he lived in (other way around, actually), George Bernard Shaw penning a poorly-attended play called Closed For Remodeling, passengers on the Titanic viewing a 1912 silent version of The Poseidon Adventure while their doomed ship was sinking out from under them, the design of California's flag being the result of "pear" being taken for "bear," or mobile homes having gained their name from the city in which they were first manufactured. At the time I saw this page, I had only seen the Mister Ed page, which was as authoritatively sourced as any snopes.com page. As you can guess, the snopes.com authors had a serious reason for populating the website with these pages (although they certainly enjoyed writing them). This section graphically demonstrates the pitfalls of falling into the lazy habit of taking as gospel any one information outlet's unsupported word. The trick is to recognize the dividing line between "reliable" and "infallible" and thus learn how to avoid throwing oneself bodily across it. Now for a religious person such as myself, there is only one reliable source of authority - in my case, the Bible. But even then you could get an errant publisher who makes a typo, a publisher who willfully makes a change (the way that most Christians feel about the New World Translation, or the way that most Mormons feel about all translations including KJV - also see here), or someone who quotes non-existent Scripture (see this page for an example). Which leads us to a lapsed Unitarian institution (ponder that for a moment) and what it taught me. As I've stated previously (for example, in this October post), one of the things that I learned at Reed College was an appreciation of original sources. While it's interesting to know what Jake Kuramoto thought of the death of Michael Lee Bedford, it's more important to me to find out what This Is Nottingham thought about it. Certainly Kuramoto and the others added perspective to the story, but the story originated at This Is Nottingham. However, snopes.com points out that even original sources could pose a problem. Another snopes.com page notes that Reuters and UPI ran a story about a man who was injured by an exploding toilet. The source for the story? The Jerusalem Post - and a reporter who rushed a story into print without verifying it. Of course those danged foreigners are pesky, but snopes.com also cites a false story that was originally reported by the Chicago Tribune. It turns out that the reporter, Gaby Plattner, reported that something occurred to her, even though it hadn't. If you go to the Chicago Tribune's website, you can see the original article, including the Tribune's retraction. Aside: If you look at the end of my December 5 post on corrections, you'll see that this is the second of five ways to correct mistakes. On the one hand, I can claim that my method of correction is identical to that used by the Chicago Tribune. On the other hand, I'm putting myself in bed with the "Dewey Defeats Truman" people. I have previously posted about Cyberworld War I, the entities that are lined up against each other, and the strange bedfellows that have been created (how often do you mention Gene Simmons and Sarah Palin in the same sentence?). Like a momentary glitch on a flat-panel display, the attacks by hackers calling themselves "Anonymous" came and went. Visa, PayPal, MasterCard and Amazon report no significant damage, and business goes on as usual. The corporations acting to cut off WikiLeaks remain safe. Although many are unsettled by the thought of a site such as WikiLeaks revealing state secrets or a group of anonymous hackers breaking the security of the banking system, events of the past week reveal that such threats are vastly overstated. [T]he real lesson of the WikiLeaks affair and subsequent cyberattacks is not how unwieldy the net has become, but rather how its current architecture renders it so susceptible to control from above. So there are cyberwarriors fighting a cyberwar, but they're the good guys (or bad guys, depending upon your point of view). And after ruminating on what Rushkoff said, I realized that while there are parallels between the original World War I and what I refer to as Cyberworld War I, there is one important difference - at least so far. World War I, conducted early in the 20th century, was by and large a traditional war. While technological advances such as airplanes were introduced, the basic concept of the war was that one big army would fight another big army. For the most part, this is how warfare has been conducted for the last several thousand years. But Americans began to see a somewhat different war in Vietnam. Guerrilla warfare was nothing new, of course, but it was during Vietnam that many people realized that the old concept of pitting one big army against another big army was not enough to guarantee victory. Sure, there continued to be big army vs. army wars, such as the liberation of Kuwait, but anyone who believed that guerrilla warfare was a minor anomaly was disabused of that notion on a September morning in 2001. An army of thousands didn't attack the World Trade Center and the Pentagon - just a couple of dozen people did it. And before the World Trade Center attack of September 11, there was the Oklahoma City attack and the first World Trade Center attack - attacks which were also executed by only a few people. So to say that 4chan/Anonymous couldn't hold up a sustained attack misses the point. Certainly if you think in traditional army terms, the 4chan/Anonymous army was nothing to worry about. But the group of people could mobilize again tomorrow, or perhaps in a couple of weeks, or perhaps in a couple of months. And like al Qaeda, they only need to win once to declare success. So in that sense, Cyberworld War I is similar to the War on Terror - an enemy that is hard to define, and victory that is hard to measure. My first thought when reading this tweet was that it went to a picture or a video of some guy in a menorah suit jumping over hurdles. But I followed the link - and believe me, as you read this post, you'll want to follow the links - and ended up discovering that Menorah was actually the name of a horse. The race had been billed as a shoot-out between the three exciting talking horses - the winner, the novice Cue Card and Paul Nicholls' Silviniaco Conti, and they filled the first three positions. Now I had only heard the term "talking horse" used in one context, and people familiar with American television shows from the 1960s know what I'm talking about. Any attempt to search for a racing-related meaning for the term "talking horse" was stymied by all of the other mentions. So, after amplifying the "International Glory for Menorah" story, I ended up looking at some of those other links, and found out something that surprised me. 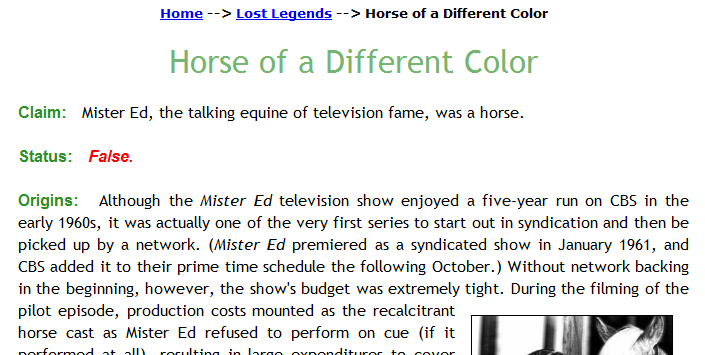 Yes, according to a page at snopes.com, the horse originally hired to play Mister Ed in the pilot of the television show was not performing on cue, which caused excessive production costs. The solution was to go to the Jungleland animal park in Thousand Oaks, California and hire a Grevy's zebra named Amelia to perform in the pilot. This worked so well that Amelia was used during the entire series. As snopes.com notes, "since the series was filmed in black and white, the viewing audience couldn't tell the difference." Snopes also cites related issues with black and white TV, including difficulties in televising NFL games in black and white when players ran into referees, and problems that prison guards encountered when watching Johnny Cash's Folsom Prison special on black and white monitors - some prisoners apparently slipped by the guards' impeded vigilance. I encourage you to read the snopes.com post, which includes a wealth of evidence regarding the whole affair, including the challenges that had to be overcome in an episode in which Mister Ed leaned up against some black painted bars, and the impending appearance of color television that nearly killed the ruse. And no, this snopes.com entry is not dated April 1. The actual date of the entry is 16 May 2008. I turned to Google to find other sources about the story, and ended up at this snopes.com page which provided even more information about this whole episode. I encourage you to read this page also. Now do you see why I told you at the beginning of this post to follow all of the links? This was created for my friends Bloose and Starfish from the Grotto BBS. It's been a couple of decades since the days of the Grotto, and now they're on Facebook and playing Farmville. What if Zynga had been around back in the day and had created games for WWIV BBS users? Then James Earl Jones said, "This...is Louis Gray." If you go online in any way, shape, or form, you have to decide upon a privacy strategy - otherwise, services such as Facebook will make your privacy decisions for you. How much information about yourself and those around you do you want to share with others? Louis Gray has a somewhat different set of privacy practices than I do. Not that he reveals EVERYTHING about himself - no one does - but some of the things that he chooses to share are not things that I would choose to share - for example, I would not join Blippy like he did. I'm not saying that I'm right and that Gray is wrong; I'm just saying that we have differing comfort levels for sharing information. For example, when I wrote the blog post Why you should never, ever, EVER delete any of your inactive accounts, I mentioned one service that Gray had quit - Plaxo - but did not explicitly mention another service that he quit. Why not? Because if I named the service, then it would be (slightly) easier for someone to sign up for the service and take Gray's old URL. But when Gray commented on my post, he had no reservation about naming both of the services (which he had named in his original post, anyway). But even Gray, who is comfortable with sharing, can get a slight surprise. It's one thing when a few hundred or a few thousand techies know your credit card habits, the ages of your children, and your work history; it's another thing entirely when CNN shares all of these things with thousands upon thousands of readers on the CNN website. Now there are people who think that Paladin Advisors is a faculty club in Harry Potter, but who also know that Matthew and Sarah like techno music, that Louis is Mormon, and that he goes to a dentist in Cupertino. Oh, and they also know a phone number which they can use to reach Gray. I do not publicly link to Facebook comments from anyone, but Gray has noted that he has been getting a call every few minutes, and that his mobile phone battery is dying as a result. Well, if Gray's battery wears out completely, at least we'll all know when he buys one. Another person who may buy a new mobile phone battery at some point in the future is Robert Scoble, another person who is somewhat open about what he does every day. And this has its benefits - Scoble snagged an interview by publicizing his own number. Progressive Insurance already has about 100,000 customers signed up for its Snapshot (formerly known as MyDrive) device. It's a dongle that plugs into a vehicle's diagnostic port, collecting data about stops, speed and driving time for at least 30 days while wirelessly reporting that data back to Progressive. Drivers who meet Progressive's standards can qualify for a 25%t to 30% discount. Starting Jan. 1, California will allow in-car cameras, a boon to California-based DriveCam, which has 150,000 users among commercial truck drivers and parents of teen-age drivers so far. It's system records video clips of the driver and front of the vehicle just before and after a crash along with data about the car's movement, and is already frequently used to determine who's at fault in a crash. More here. Now I'm sure that some people will argue that there is no problem in sharing this type of stuff, and if it finds you breaking the law, tough. So where are you on the privacy scale? What information do you choose to share? What information do others choose to share about you? And if you want to take advantage of the non-existent prize that I am not going to give away for the best comment on this post, please post your full name, your birth name, your address, your Social Security Number (Todd Davis, we already have yours), your weight, and your cholesterol level in the comments. When referring to a former co-worker, a company is often very careful. Even if the co-worker was a complete jerk, the company takes great pains to discuss the co-worker's positive traits. A lifelong resident of Hamilton County, Billy grew up in Tiftonia. He was the youngest of four children. His father owned and operated Woodrow Long’s Garage and Wrecker Service in Tiftonia for many, many years. Billy graduated from Central High School in 1970. His class was the first to graduate from the new Central on 58 Hwy. After high school, Billy joined the Army. Billy was a volunteer to the Army even though Vietnam was in full swing at the time. His first three years in the Army, he served with the 82nd Airborne in Fort Bragg, N.C. He also worked in traffic for many years and was one of two officers to start the Motorcycle Division of the county in 1981 and conducted the first training classes for other Hamilton County Agencies. He also served as Special Events Coordinator for events that are conducted throughout Hamilton County to include the Riverbend Festival, the County Fair at Chester Frost Park, and the Air Show at the Chattanooga Metropolitan Airport. In 2004, he conceived the idea and became the first Court Liaison Officer for the Hamilton County Criminal and Sessions Courts. As a direct result of this, his coordination with the Criminal Court Systems saved the County thousands of tax dollars. And finally, Billy was elected as Sheriff of Hamilton County and took office September 1, 2006. He served for approximately seventeen (17) months before being indicted on twenty-seven charges, convicted, and subsequently incarcerated for a fourteen year sentence. Mr. Long’s crimes, in which authorities established he acted alone, began in early 2007 with his shakedown of local Indian convenience store owners, taking in about $23,000 with threats of violence caught on videotape. Judge Mattice ultimately rejected claims that the government’s year-long undercover sting somehow influenced Mr. Long’s choice to continually break the law. But those Motorcycle Division training classes were wonderful. What's the lesson here? There is good and bad in ALL of us. The RAID book 6th edition, a work by the RAID Advisory Board, is a bland, technical description of RAID technology. The explanations of topics are rather theoretical and/or academic in nature as opposed to books that explain things by relating them to their application(s) in the real world. Unfortunately, the RAID Advisory Board publication (which is still on my bookshelf at work) did not contain similar illustrations. From television evidence, I know that RAID forms a cloud that turns bugs into coffins. Too bad that I couldn't have learned about disk storage mechanisms in a similar manner. But all of that changed in the 21st century. As I mentioned, the RAID Advisory Board now appears to be defunct, but today (or at least in 2009) Simply Storage has a video that explains how RAID the technology works. On Monday, November 29, I wrote a post entitled http://empoprise-bi.blogspot.com/2010/11/unsharing-unpublishing-unpushing-less.html. In that post, I tangentially touched upon another topic. [Louis Gray] also pruned entire services by deleting some of his accounts (e.g. his Plaxo account). Incidentally, I don't believe in deleting old inactive accounts (or old inactive blogs), but that's the topic for another post. Time to revisit the topic, based upon something that I read earlier today (and shared in my Amplify blog). The original post, written by Stan Schroeder in Mashable, was entitled Remember Summize? 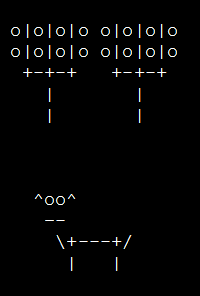 It's an Ad Farm Now. For those of you who don't remember Summize, it was a company that provided the capability to search Twitter. Twitter bought the company and integrated it into its own service (although Twitter's load essentially meant that on-site Twitter search was extremely limited). Twitter (Twitter) let the domain name summize.com expire some time ago, and now it’s just a long list of advertisements. In the end, Twitter looks bad to those (admittedly few) people who go to summize.com and find something other than what they expected. This principle does not only apply to websites; it also applies to web pages and accounts. I can think of at least two quality blogs that I used to read. When the bloggers quit blogging, they also deleted the blogs. Because of the established URLs, it wasn't long before the URLs were taken over by advertisers. How long before Louis Gray's abandoned URLs are taken over? It doesn't appear that this will occur in Plaxo because of its URL format, but the URL for one of his other services is ripe for the picking. Back in July, I wrote a post on Islamic banking, a concept that is (literally) foreign to me. As an update, I wanted to link to two newer articles that discuss the business. [A]s Internet access increases in the Middle East and the Muslim middle class expands, so will the presence of Islamic online banking. One sign of this is the online Dow Jones Islamic Market Indexes. Another is Failaka, a research and advisory fund in Islamic financial investment established over a decade ago. That Failaka’s Website lists more members on its shariah advisory board than it does professional staff may obliquely highlight why there’s a lag in Islamic banking’s online parity with its conventional peers. The imperative that an Islamic financial institution have an advisory board of shariah experts may slow decision-making and, hence, transactions, making them no match for Internet speed. Moreover, until recently, there has been a shortage of professionals who are experts in both Islamic law and economics. Islamic bonds that pay returns based on cash flows from airports and utilities rather than income from property may stay in favor in the coming year after a drop in Persian Gulf real-estate prices shook investor confidence.